March Monthly Crate + Weekend Sale + Giveaway! Skybound Scrolls, New Monthly Crate, New Shards in Store, Weekend Sale and More! New Slayer Mob, Bug Fixes Galore, Weekend Sale, New Promotions and More! New COMET iKIT, Tons of much needed bug fixes, Sale and more! Rank Subscriptions, New Combat Zone, AH Cancelation, Shards Return, Bug Fixes and more! Monthly Crate, New Combat World Zone, Slayer Tier 3 Set, Weekend Sale and more! New Rank, Island Merge, Bunny Shards Back, Sale and More! Server Merges, New Combat World Zone, Island Rework and more! New Immortal Shard, Double Drops, Combat World Update, Shop Sales and LOTS MORE! The Savage Games team is back with another build event for the month of March! 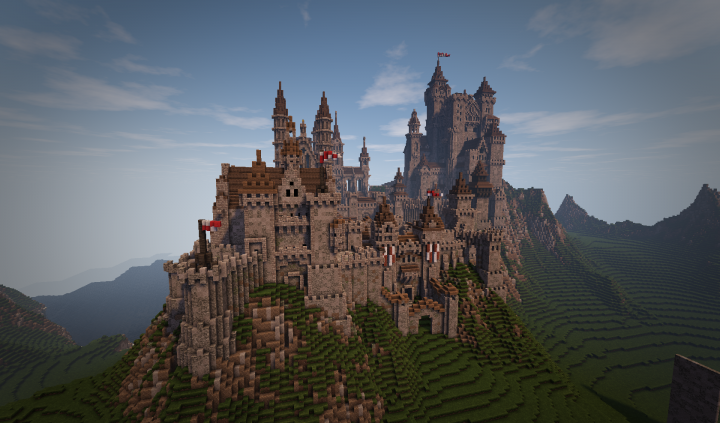 This months build event is Medieval themed! Travel back in time and discover a world of Kings, Queens, Dragons and Jesters! This month, we are expecting some awesome builds! Will your build have a mighty village, or perhaps swords and shields!? Bring forth your creativity and shed light onto those of thee unknown! I encourage you all to think outside of the box and come up with some EPIC and CREATIVE builds for us! Get detailed and get ready to set the bar high! You may submit up to 1 entry on the world of your choice via Skybounds or on Kingdoms. Please use the submission link at the bottom of this page to enter the contest. Rules are published below -- Please take the time to read over and review the these guidelines. You must submit an entry via the link at the very bottom of this page. Please note that all winning prizes will only go to the island your entry is built on. Kingdoms New Bandit Boss, Bandit Armor, Diamond Generators, Custom Stats & BP Schematics! First appearing in the wastelands known as the Warzone during the XP Storm Random Event, this devilish little boss is the first of MANY mini bosses to enter the land of Kingdoms. All of these questions have no answer as the bandit is covered in a shroud of secrecy. The only thing we know for sure is that he brought a new set of armor, and a delightfully painful mace into the scenery. When he first appeared we sent in squadrons of soldiers to attempt to defeat him, but none came out successful. The squadron that fared the best was a team of 4 fully diamond players who brought this boss down to 1% health before perishing. And through all of that, the only thing we know for sure... whoever takes him down first will forever be known as The Bandit Slayer. There are also some mysterious eggs appearing throughout the land of Kingdoms, supposedly they force The Alpha Bandit to spawn in... but beware, he is not to be trifled with. With The Alpha Bandit entering the world, his armor also comes with it. The month of February has passed, however, the memories will continue to live on! Welcome to the fifth official Community Update post for the month of February, 2019. For those of you who have yet to play last month, or perhaps want to brush up on anything you may have missed out on, now you can review it all here in one place! Discover fellow community members around you; their creative builds, events won, video showcases and miscellaneous achievements throughout all worlds! Sit back, relax and see what all went down this month in February! The Top player of the month is here! Through thick and thin, sickness and health -- you got it, this player made sure to be online no matter what it took to accomplish it. The Top Player of the month is an individual who has been online longer than all other community members server wide! If I don't call that dedication, then I don't know what that is! Congratulations to, CMMDiamondz, for outlasting and outshining those around you with an absolutely insane playtime of: 3 Weeks and 4 Days! Your hard work has paid off for you this month, because you are now officially crowned the Top Player of February 2019! With this accomplishment you will be rewarded with an exclusive forum prefix and some top quality in game loot! Please remember to comment below in order to claim your forum tag too!